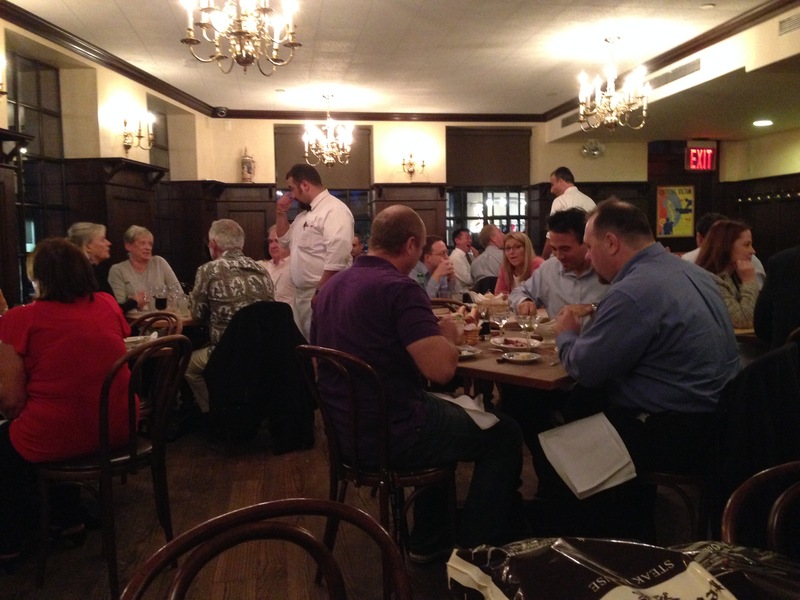 Praise the lord and pass the statins – our pilgrimage to the mecca of meat, Peter Luger. Oh, I sing a song of meat. Not just any meat, mind you, but the meat of the gods. Peter Luger meat. If you are a vegetarian, or heaven forbid a vegan, I beg you to turn away. This will not be pretty, and I don’t want you to hate me. Come back some other day, when I write an essay about the glories of carrots or yeast, or somesuch. I have deep respect for your excellent choices, but as my beloved former boss Paul Brest used to say, if god had meant us to be vegetarians, he wouldn’t have made animals out of meat. I can’t tell you how many times I have made my way across the Williamsburg Bridge and been tantalized by the glimpse of what may be the world’s greatest steakhouse, Peter Luger. There it sat, lurking beneath the bridge, beckoning to the hungry, the gluttonous, or to the seekers of meaty self-actualization. 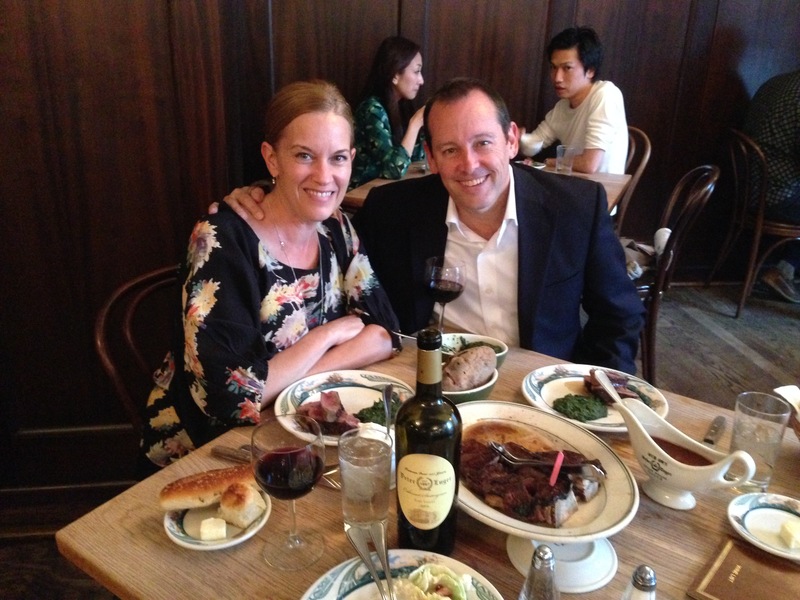 Someday, I would often think, I’ll have a Peter Luger steak. And yet nearly a half century went by and I failed to keep my promise. Why didn’t I just go, you may ask? There were any number of reasons. For many years I would have had to sell my baseball card collection and a few quarts of blood just to make it past the shrimp cocktail. And for heaven’s sake, it was in BROOKLYN, and in Williamsburg, no less. But times have changed in oh so many ways. I’m all grown up with gainful employment (sort of) and Williamsburg is the BOMB. And if you have been following my recent journey, you will know that I am finding any opportunity I can to go back and either perfect the past or fine tune the future. I recommend it, by the way. When we decided to spend part of our trip in New York, I swore to myself that we would at long last make it to Peter Luger. What’s so special about this place? Certainly not the décor. It’s a room. It has wood floors, it’s nice, it’s old, but if they didn’t make steaks that made you want to weep, you wouldn’t think twice. The waiters wear long aprons, which bring to mind a Bemelmans sketch, so that’s nice, but still. Nothing fancy. A little too bright, a little plain, but just right. No, what’s special is the meat. They buy these fancy, shmancy USDA Prime cuts of beef and then hang them in some special room for a month until they get good and funky and covered in mold (good mold, they say). They say that this concentrates the flavors. Then they hack off the mold (I assume) and cut up the hunks of beef into steaks on the day they’re going to serve them. 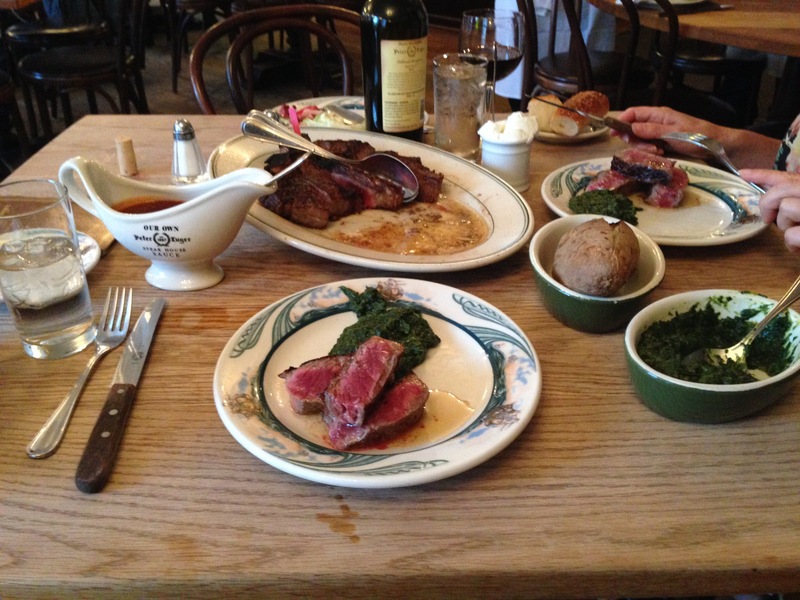 The cut of choice at Peter Luger is the porterhouse, or what you and I know as the t-bone. The t-bone has a piece of filet mignon on one side of the bone and the strip steak on the other. Then they take your t-bone and throw it in an 800 degree broiler that creates a crust that you could stand on, but which leaves the inside a very comfortable medium rare. Don’t be afraid. The steak looks really rare, but with all that aging and tenderizing and whatever else they do to it, you won’t die. On the other hand, if you were to order your steak well done I suspect that the rotting corpse of Herr Luger himself would rise up out of the floor and strangle you with his moldy hands, and good for him I say. So they take this crazy good meat and blast it with a krillion degrees of heat and then they start improving on it. When it comes out of the oven, they slice for you, which coaxes the juices onto the platter, at which time they drown the whole operation in a stick of butter, which somehow never undermines the structural integrity of that magical crust. The salty, fatty, buttery sauce seems to wick its way back into the steak through some kind of magical capillary action. The filet mignon becomes the foie gras of meat – livery and tender and spectacular. When I took my first bite I groaned. The strip is marbled and fatty and ridiculous. Quite simply, the world’s greatest steak. By this point, every cardiologist in the tri-state region orders a new Mercedes. They serve your steak with a boat of Luger’s famous steak sauce and a defibrillator. For dessert, you can order the carrot cake or a bowl of Lipitor. I might add that the sleeper of the evening was the creamed spinach. Mercifully, they seemed to go easy on the cream, but somehow found a way to make the spinach even spinachier. I think they put spinach on the menu at steakhouses as a joke, but Lugar’s doesn’t mess around. If they’re going to serve spinach it will be the best damn steakhouse spinach of the plant. We order the mysterious bottle of private label Peter Luger Napa Cab that was, as everything else was, right on the money. And how do I describe the steak? It’s easy. It was the best damn piece of meat I’ve ever eaten. I went back and read some reviews and some of the jaded restaurant critics crapped and moaned about indifferent service or the fact that they don’t take credit cards (although they take debit cards and who doesn’t have one of those?) or their location or some other cranky pants minor infraction. But my good god people, this is one of those instances in which somebody has perfected a task that requires time, money, and skill, and for that I am eternally grateful. The happy couple, right before the paramedics came. And for the record our waiter Ivan was funny and sassy and we wanted to take him home with us. Like our friend Larry from Russ and Daughters, he knew that what he was feeding us was poetry and he was damn proud of it. On the other hand, there are any number of fussy, expensive, self-important places that send the gastronorati into a frothy frenzy but which then close before we can remember what we ate. Don’t get me wrong, I like hipster food as much as the next guy, but if you gave me twelve hours to live and made me pick a last meal, it might just be a Luger steak, the mystery cab, and that crazy spinach.